First, figure out how much space you’ll need for your library. 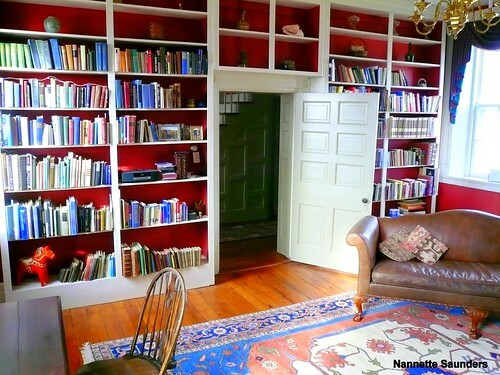 Is your spare bedroom big enough to hold all of your books? Is it so big that you worry about too much extra space? Decide whether a shelving unit would work best, or if the room is better suited to built-in shelving. Look online at other reading room designs for inspiration. Also, consider your main light source. If you have large window, such as a bay window, perhaps a window seat would be a nice touch! Next consider your furniture. If you’ll be using this space for the occasional work as well, decide if a desk is necessary. Then move on to the fun part! Pick at least two spaces to create your reading nooks—your comfy corners or extra plush chairs that you can settle into to lose yourself in a good book. It will be nice to have a couple of options, such as one to take advantage of your natural daylight, and another one with a nice lamp with ample light from a lamp. A couch will also be a great staple, and can be complemented with a coffee table and area rug to create a focal point in the room. To control light in the room during the day to make sure it’s not too bright when the sun is at its highest exposure there, light-control shades from www.theshadestore.com are helpful in creating a sanctuary-like environment. Make sure you use a main color and at least two but no more than three accent colors that match the main color. Your main color will be on the walls and variations of it will be included on the shelves and furniture. Accent colors can go on the wall trim, area rugs, lamp shades, window shades, and curtains. Any knick-knacks you display in the reading room should also be in accent colors that complement your main color scheme. Denise is an accomplished home chef with a knack for sauces, tapenades and homemade cocktail mixers.